Here’s what happened in last night’s game as the party set off for the Serpent Hills on the trail of Varram the White. Each PC gets 3,300 xp. Crake spends the week disguised as his noble alter ego and hobnobs with a bunch of wealthy merchants, beating them at cards. Rosie makes contact with the Zhentarim in Manysteps Alley. As well as Jamna Gleamsilver, she sees Tyler Logan (the cell leader she had a run in with last time she was in Waterdeep) again – there is clearly no love lost between the pair. Jamna gives Rosie a sending stone and asks her to keep in regular contact. Turin visits New Olamn College and learns some new songs to play on his cittern. Ug visits the House of Wonder and agrees to undertake a quest to bring back a circlet of seven serpents to the temple. The party travel south from Waterdeep to Boareskyr Bridge, dealing with a group of dragon cultists who attacked a caravan near Daggerford. At Dragonspear Castle, zombies clamber out of the ground to attack the party, but Gwastdyn, wildshaped into a giant eagle, swoops down and carries them off before dropping them to their doom. Unfortunately the druid's flight over the castle is cut short when he slams straight into a wall of force, and has to be rescued by Crake. The PCs defeat a second band of dragon cultists on the Trade Way. Gwastdyn wildshapes into a giant elk and squishes the dragonsoul leader with his hooves after Rosie polymorphs him into a crayfish. The party arrive at Boareskyr Bridge, spending the night in Bolo’s Tentside Inn. They learn that Varram the White killed a “scaled folk” spy before heading into the hills with over a dozen men. Rosie sends a report to Jamna using her sending stone. The PCs head into the Serpent Hills following Varram’s trail. 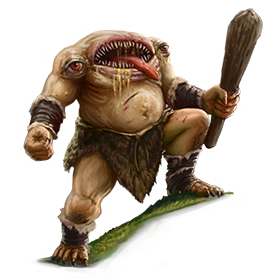 They kill a weird-looking blemmyes by means of an effective combination of summoned wolves and Turin’s dissonant whispers, and rescue the two tribesmen it had captured for its dinner. The trail leads through an arch formed from the coils of a great petrified serpent. At Ug’s insistence, the PCs climb up the slope to the serpent’s “head” and go inside. When they spot a shimmering portal inside its mouth, they decide to return to the trail and their mission, much to the half-orc paladin’s disappointment. The PCs arrive outside the Tomb of Diderius. They explore the ruined buildings but give the two giant statues flanking the entrance to the tomb a wide berth. Camping for the night inside a crumbling tower, they are attacked by three trolls. Rosie falls unconscious twice, but the adventurers do manage to kill two of the foul creatures. The third one escapes down the well outside after Turin casts compulsion and sends it packing. The PCs decide to dig up one of the shallow graves they found outside the tomb – the body inside hasn’t been dead long and still shows signs of both bludgeoning and slashing wounds. Ug approaches the statues which animate and speak to the party, asking them if they seek wisdom or knowledge. The PCs reply that they "seek wisdom" which appears to satisfy them “as long as you show proper respect”. Using magic, the PCs get up to the ledge holding the tomb entrance. Gwastdyn wildshapes into an eagle and flies inside past six cowled wizard statues. The room beyond is decorated with a mosaic depicting a knight in shining armour battling a chimera. When the adventurers enter the room, the chimera rises up out of the mosaic and attacks the party. After it breathes fire on the heroes standing in the entrance, it flies up to the ledge running around the room. Ug isn’t about to let another flying monster get the better of him and misty steps up there to attack it, joined by Gwastdyn. The others attack from range – Crake finishes it off with an arrow. Behind the door marked “SAFE” in chalk is a round chamber containing a well and a stone basin. Ug fills the bucket from the well a couple of times, empyting the water into the basin and pulling the lever on the wall. The water empties out but the PCs can’t figure out where it’s gone. Back in the mosaic room, Ug wrenches open the bulging double doors to the north, sending a load of rubble crashing into the room, nearly burying Rosie. The "Anthropophagus" features as the star monster in the YA book The Monstrumologist & I always appreciated the oddity. Glad to see it here too. Are you talking about the blemmyes? My players thought the name was very funny but it turns out they're a mythological creature. I used the one in Tome of Beasts from Kobold Press. Sadly it didn't get to swallow anybody! Yeah, it's a weird archetype!